Dalmally is a small village spread along the Strath of Orchy two miles east of the tip of Loch Awe. The name means Pebbled Valley, and the village probably started as a settlement serving nearby Kilchurn Castle. Today's Dalmally is split into two fairly distinct pieces. 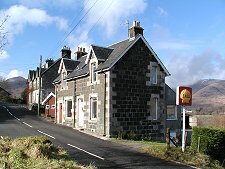 To the west, the A85 now bypasses the main part of the village. 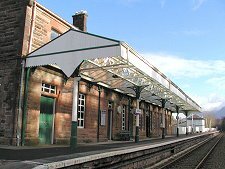 This is clustered around the railway station, built in 1877 when the Callander and Oban railway temporarily terminated here while they built the rest of the line west to Oban. Today, trains from Glasgow to Oban stop here. Dalmally is also on the route of the Coast to Coast Walk from Oban to St Andrews. Nearby are a collection of attractive cottages and a village shop as well as a "Shell" sign that looks as if it has outlasted the available supply of petrol by several decades. 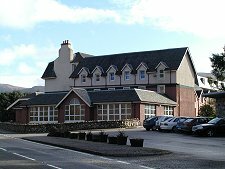 Near the railway station is the junction from which a narrow single track road wends upwards through forested hills to a monument commemorating Duncan Ban MacIntyre, the renowned Gaelic poet who was born in Glen Orchy in 1724. The views from the monument are perhaps more impressive than those of the monument itself, which has a slightly unfinished air. From it you can see across to Loch Awe and Ben Cruachan in the west, Ben Lui in the east, and the Glen Kinglass mountains to the north. 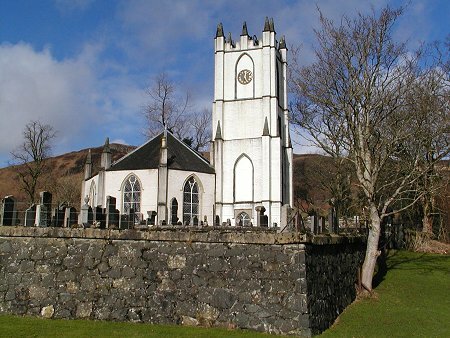 The eastern part of Dalmally lies close to the strikingly attractive Glenorchy Church, complete with stunning views along Glen Orchy to Ben Cruachan and its neighbouring mountains and a fine collection of medieval grave slabs. The church was built in 1811 by the 4th Earl of Breadalbane and has an unusual octagonal design. 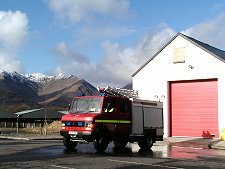 Also at this end of the village is the largely modern Dalmally Hotel and the fire station: as well as the bridge by the church that carried the old military road across the River Orchy. This dates back to 1780. Most people en route from Tyndrum to Oban will probably pass by Dalmally without really noticing it, but like so many highland settlements it repays exploration.